iuvo Technologies is an IT consulting company providing businesses with IT services and solutions, so you don't have to. Our core belief is technology should elevate your business results, not hinder them. With security threats at an all-time high, protect your business from vulnerabilities and threats by implementing a strategic and comprehensive IT security plan that iuvo Technologies develops. Ensuring your business has 24/7 data restoration, backup coverage, and is operating at peak performance, allows you to focus on driving business results. Having a Cloud Computing IT expert available will help you navigate the options to find secure, scalable, and highly available applications that best aligns with your business goals. As your IT Managed Service Provider, iuvo Technologies helps you unify and enhance your communication, align your workforce, and maximize your productivity by taking advantage of the best messaging and collaboration services available. Proactive, practical, and customized IT support services are created to solve your existing IT problems and prevent new ones from cropping up. Increase your business performance and productivity with remote monitoring and management. iuvo Technologies will help you continue to operate at peak efficiency by keeping your systems secure and operating at peak efficiency. What part of your IT keeps you up at night? Find out how iuvo Technologies will empower your business through technology. 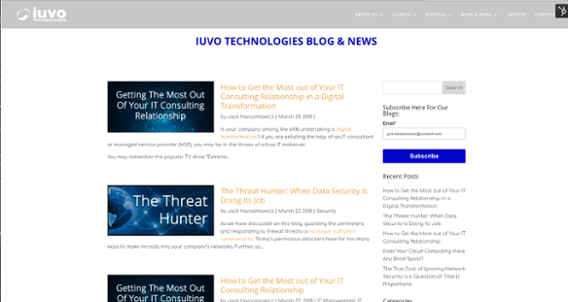 At iuvo Technologies, our goal is to be both your trusted IT service provider and business advisor by providing proactive, highly customized, practical expertise and solutions to your unique business environment. We take pride in hiring the best people – rock star IT professionals who have a unique combination of people and technology expertise – who give you the breadth and depth to get you the right IT services and solutions for your business, the first time. We wanted a fresh approach to IT. So, we completely outsourced IT to iuvo Technologies. We rely HEAVILY on iuvo Technologies to work closely with our organization. What I value the most is that they are not just IT partners, they are business partners, and challenge us to think in terms of managing IT as a business. Turnkey solutions to solve technical challenges. They go a step beyond and fix or enhance the solution entirely. iuvo truly acts as an extension of my DevOps team. They challenge me and provide solutions based on their experience, that have helped me avoid landmines. iuvo meet my needs in a custom way. They have practical expertise that is applied to YOUR specific situation. They know which corners you should cut and which corners you should NEVER cut. iuvo goes well above and beyond everything. In my 30 years, with most consulting companies, you have to read the fine print. They don’t have your back – iuvo has your back. It’s a win-win solution for both companies.